So my new diet ends up looking a lot like the recommendations one hears to ‘make sure at least half your plate is green at lunch and dinner.’ Tons of produce, whole grains, nuts and dried fruits, and then a little more leeway at dinner, but still big on veggies. I won’t dwell on the topic, but I will tell you that this is a very good way to increase your fiber intake. What I do want to talk about is feeding Leo while dieting. He’s down for the fresh fruit, the dried fruit, and the whole grain bread (just let him spread his own cream cheese or you’re going to spend 15 minutes in temper tantrum purgatory). 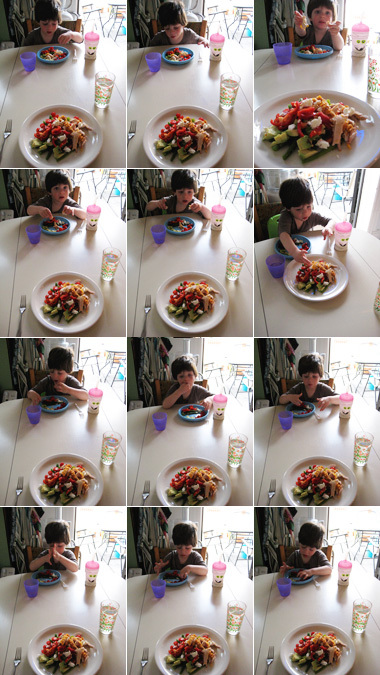 And to give credit where credit is due, the kid is not against vegetables, per se. He likes grape tomatoes, cucumbers, avocado, green beans, red bell peppers, sugar snaps…you know, the vegetables kids tend to like. I’m not complaining. I did try to pass off whole wheat spaghetti with kale pesto last weekend, but I had a back-up pot of the spaghetti with butter and cheese on the stove just in case, and indeed, the green stuff was a no-go. Okay, actually I am complaining, because living with Leo is a minefield these days. 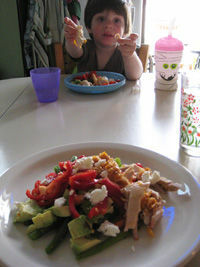 “Tonight,” I announced last night, “is Mommy and Leo Salad Night!” I proceeded to scrounge around in the fridge and come up with what I thought was a fairly respectable dinner a deux: leftover oven-fried chicken atop a salad of green beans, grape tomatoes, avocado and red bell pepper. When Leo started to crank, I abandoned the idea of steaming some frozen corn to top it all off and crumbled on some fresh goat cheese instead. Leo’s salad was composed (ie not touching too much), while mine was piled (okay, heaped, I’m so HUNGRY!) then drizzled sparingly with a mustard vinaigrette. I took pictures of our plates. We sat down. Leo looked optimistic for a moment. Then he objected… to the corn-flake coated chicken that he had scarfed down the night before. What gives? Reader, please do not think I am a heartless mother: I snapped photos as Leo decided how big of a stink to make about the chicken, ended up insisting on transferring each offending piece to my plate (hey, I’m hungry!) then sort of diddled around with all the other choices and finally decided he wasn’t hungry. I figured it might be funnier in retrospect, and the camera shielded me from the full impact of Leo’s scowls. I then shoveled in my entire salad in a state of anxiety, waiting for Leo to really blow a fuse, which he didn’t do until a little later in the evening. As I tossed his untouched dinner into a Tupperware, I threw my hands up. There is only one sure thing about Leo right now, and that is that he can find a way to make me throw my hands up. He’s asserting himself. He’s expressing his frustration with being small and powerless. He’s reflecting the complexity of his emotions when he doesn’t know what he wants, or what he doesn’t want. He’s expressing his opinion of my assumption that I’m the mommy and I get to decide stuff. He’s doing exactly what he should be, come to think of it. Me, I’m just trying to be nice to my son without getting put through the wringer of imperious, irrational toddler whims. And, I’m trying very hard to eat what I should eat, and not eat everything else. Sounds simple enough, right? If only someone would take pity on me and tell me what Leo’s next phase will be, so I can mentally prepare myself! Can we go back to the lovey-dovey one? Or what about Happy Day? I liked that day. Ah well, whatever is up ahead, I hope to encounter it in a smaller pair of jeans. Happy Salad Day!